Today I'm going to show you how to FINALLY fix your cloudy swimming pool water, FAST. When you're done reading this guide, you'll finally be able to see the bottom of your pool again and allow you to enjoy it again since it won't look so unappealing. Not only that, but clearing cloudy water is actually an EASY fix. Without further ado, let's walk through how to do exactly just that. Have You Shocked Your Pool Lately? Before you set about clearing cloudy pool water, it helps to understand what is causing the problem. In some ways, getting to the source of your pool's cloudiness requires you to play chemist. We'll try to break it down for you in plain English, though. Take a look at a few of the more common causes of cloudy pool water and then we'll got over how to clear cloudy pool water. Adding chlorine to pool water helps to keep your pool safe for swimming—simple as that. Chlorine kills off bacteria and other micro-organisms which cause unpleasant diseases and health problems like athlete's foot, Legionnaire's disease and ear infections (source). Your pool's chlorine levels will fluctuate based on how many people swim in it, based on the amount of rainfall you receive, and based on the amount of sunlight that shines on the water. (Read: how to help when your pool is overflowing with rain). The sun's UV rays can destroy the chlorine (source), and lots of rainfall will also dilute its levels, giving microorganisms a chance to multiply, which affects the appearance and safety of your pool. If the chlorine level in the water is too high, it's also possible for the water to take on a murky or opaque appearance. As the levels drop, due to swimmers using the pool or the sun's rays burning it off, the cloudiness should clear up. You should test your pool's levels each day to make sure they aren't too low or too high! If a lot of people swim in your pool regularly, you might need to test the levels more frequently. The suggested amount of free chlorine is between 2.0 and 4.0 parts per million (ppm). Your pool filter and pool pump need to run for a certain number of hours daily to do its job properly. How long you should run the filter for each day depends on the size of your pool, how frequently people use it, and the type (DE filter, or cartridge filter). Usually, running the pool filter for at least eight hours a day is ideal. When the filter doesn't run for long enough, the water in the pool becomes stagnant. Bits of debris and tiny particles build up, making the pool water turbid and opaque. So be sure your filtration system is running on all cylinders. How hard the water in the pool is can also influence whether it's crystal clear or murky. Water that's too hard—meaning it has high amounts of calcium in it (read how to remove calcium from your pool)—is more likely to be turbid than soft water. High calcium levels don't only make a pool cloudy—they can also cause damage to the pool filter and plumbing, thanks to the buildup of calcium deposits. Having water that doesn't have enough calcium can also be an issue. When the water is too soft, surfaces can wear down or corrode more easily, shortening the lifespan of the swimming pool. Let's not get super technical here, but the pH of your pool water, or how acidic or basic it is, can also cause it to be cloudy or clear. When the water is too basic, meaning it has a pH over 8.0, the chlorine isn't able to work as well (source). If the pH is too low, less than 7.0, the water is too acidic. Having a low pH can cause damage to the lining of the pool, causing it to wear away. Debris and particles from the corroding lining can cloud the pool's water. Rainwater might seem like it's the purest type of water out there. But it can spell trouble for your pool, as even a bit of rain can be enough to mess with your carefully calibrated chlorine levels. Excessive rainwater can also muck up the balance of other pool chemicals in the water. Since it's super impractical to suggest that you cover up your pool every time it rains, the better option is to monitor your pool after rainfall. If the water looks cloudy, test the chlorine, pH, and other chemical levels with a test kit, then adjust as needed. Sometimes, the best way to correct issues with the water in your pool is to "shock" it. If you notice that your pool has a powerful chlorine odor or if the levels of combined chlorine are higher than they should be when you take a water sample, shocking the pool is in order (source). 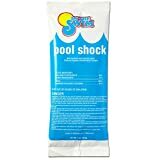 Shocking your pool raises the chlorine to up to 10 ppm, and the super high dose of chlorine leads to the breakdown of dangerous chloramines (which are responsible for that distinct "pool" smell). The high level of chlorine also kills bacteria and pool algae in the pool or pool's filter system. An undesired aftereffect of shocking your pool is this: it can cause cloudy pool water. In some instances, the cloudiness is a temporary thing (source). Running your pool's filter right after shocking can help it quickly clear away the particles and debris that cloud the water. The condition of your pool's water before you shock it can also play a role in whether or not it ends up as cloudy pool water afterward. For example, if the water is fairly basic, with a pH over 7.6, shocking the pool can disrupt the solution of bicarbonates in the water. To keep that from happening, test your pool's pH before you shock and only use the treatment if the pH is 7.4 or lower (but higher than 7.2). Having hard water in your pool can also present a problem when you go to shock it. If you add a product that has a high level of calcium to a pool that is already pretty high in calcium hardness, you're likely to end up with water that's clouded by calcium particles. Your best option, if you have hard water, is to choose a pool shock that doesn't contain calcium hypochlorite. Calcium hypochlorite shock products might not only be an issue for you if you have hard water. 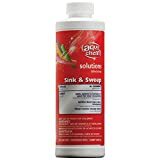 The quality of this type of product tends to be lacking, mean it leaves a fair amount of undissolved solids floating about in the water. If you are concerned about the shock product you use dissolving quickly (or at all), it might be your best bet to choose a product made of very fine particles or even a shock product that is chlorine-free. Alright, now that we know what we're dealing with, let's get to how to fix cloudy pool water. Although you can clearly see that your pool water is murky, you won't be able to tell what's wrong with at a glance. That's where a pool water testing kit can come in handy. A testing kit lets you measure a variety of factors that affect the quality of your water so that you can balance your water. Usually, you have two options when it comes to testing your pool's water. 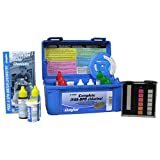 You can purchase test strips, which you dip into a water sample to measure pH, chlorine, total alkalinity and calcium hardness. Remember that high alkalinity, high pH, and high calcium hardness can cause cloudy water. Another option is to purchase a kit that includes reagents, which you add to the water. The reagents cause the water to turn colors based on the chlorine present or the pH level. Whatever type of test method you use, it's important to source the water from your pool correctly. A good idea is to pull a sample of water from 18 inches below the surface. It's also ideal to catch your water in the morning before the sun has had a chance to burn off any chlorine. If there is a problem with the chlorine, pH or other chemical levels in your pool, adjusting those levels can be enough to correct the cloudiness. For example, if your pool water is too basic, you can add hydrochloric acid or sodium hydrogen sulfate to lower the pH. If the water is too acidic, you can use sodium carbonate to raise the pH. Be sure to also use chlorine stabilizer (aka cyanuric acid) to protect your chlorine levels. Sometimes, a bit of preventative maintenance is what it takes to keep your pool water sparklingly clear. 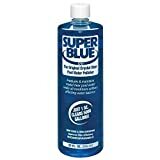 A water clarifier, such as the Robarb Super Blue Clarifier (click here to check the price on Amazon), helps to reduce murkiness in pool water. The clarifier causes tiny particles in the water to clump together, and your pool's filter is then able to filter the larger clumps of particles better, removing them from the water. Pool flocculant, or "floc," has some similarities to a pool clarifier, but isn't quite the same thing. When you use pool floc, such as this one from Aqua Chem (click here to check the price on Amazon), you dissolve the powder in water, then spread over the surface of your pool. Switch the filter pump off and wait for up to 48 hours. During that time, the particles that are making your pool cloudy should clump together. Instead of moving through the filter, though, they will gather on the bottom of the pool. To clear the water, you should use your manual vacuum to vacuum up the clump of particles. The filter on your swimming pool is most likely located at the top of the pool. That's great for removing particles that float to the top, but not so helpful for debris that gets trapped on the bottom. There are a few ways you can help your pool's filter work more efficiently and keep your water clear. Drain the water from the bottom. If you have an in-ground pool (read: how to open an inground pool), it's likely that there's at least one bottom drain. Opening up the bottom drain on occasion can help circulate the water in the pool so that particles from the bottom rise to the top, where the filter can clear them out. Vacuum your pool. If you have an above-ground pool and no drains, placing your pool's vacuum cleaner in the center, at the bottom of the pool, then turning it upside down, will mimic effects of a bottom drain, stirring the particles up towards the filter. (Read: how to vacuum a pool). Stir the water. Brushing the water with a pool brush or having people go swimming constantly can help bring debris from the bottom to the surface. Keeping your pool's filter clean helps it work more efficiently and improves the overall appearance of your swimming pool. The more debris and particles build up on a filter, the harder it needs to work. Eventually, the filter can become so clogged that it can't do anything to clear your pool. We recommend using a commercial filter cleaner at least twice during swim season. If your pool's filter is gross and clogged up, the best option might be to replace it with a new one. Maintaining your pool throughout the season will not only keep the water looking great, it will also ensure that the water is safe enough for anyone who wants to jump in. For best results, create a weekly maintenance routine to monitor the health and quality of your pool. Removing large pieces of debris (such as leaves) from the water. Brushing the bottom and sides of the pool to remove dirt and algae. Checking the filter and removing any huge clumps. Testing chlorine, pH, and other levels. No one wants to dive in or swim in a pool that's so cloudy it's practically opaque. Keep your pool water clear by testing it often, making adjustments as needed and keeping out with routine maintenance!